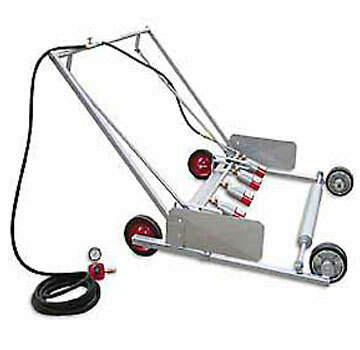 PRODUCT: FLAME ENGINEERING RED DRAGON SPA-540A 5-TORCH MODIFIED BITUMEN APPLICATOR WITH EASY MOUNT ROLL AND SIDE SHIELDS. PRICE/EACH. • 5 durable 400,000 BTU vapor torches. • Easy-Roll mount system eliminates spooling. • Side Shields concentrates heat on the material. • Manifold distance easily adjusts to-and-from the roll with simple twist of handle. • Torch / Manifold angle adjustable to create proper flaming angle. • Lighter weight than the competition. • Torch Head spacing is 5" on center. • Handles up to 39" (1M) roll width. • Overall machine width is 42 inches. Ships as a kit. Some assembly required. FLAME ENGINEERING RED DRAGON 400,000 BTU REPLACEMENT TORCH HEAD. PRICE/EACH.